In August of 2016, an NFL player made a small gesture that shook a nation. After choosing not to stand for the national anthem in protest of police brutality, the name Colin Kaepernick and the beliefs he stood — or in this case sat — for inspired some, offended others, and undoubtedly stirred up controversy in a country that values sports almost as much as freedom of speech and the right to protest. Since 2016, Kaepernick’s fight for social justice has led to a very public integration of politics and sports in America. Athletes have followed Kaepernick’s example by kneeling during the national anthem and it’s confusing America. Is the act of choosing not to stand for the anthem unpatriotic and disrespectful to fallen soldiers and war veterans who fight for the freedoms of American citizens? Or is it more “American” to recognize acts of social, political and racial injustices by publicly protesting during a nationally broadcasted event? After Kaepernick sacrificed his NFL career pursuing activism, Nike decided to endorse the former San Francisco 49rs athlete and include him in its most recent “Just Do It” advertisement campaign. A photograph of Kaepernick stamped with the quote “Believe in something. 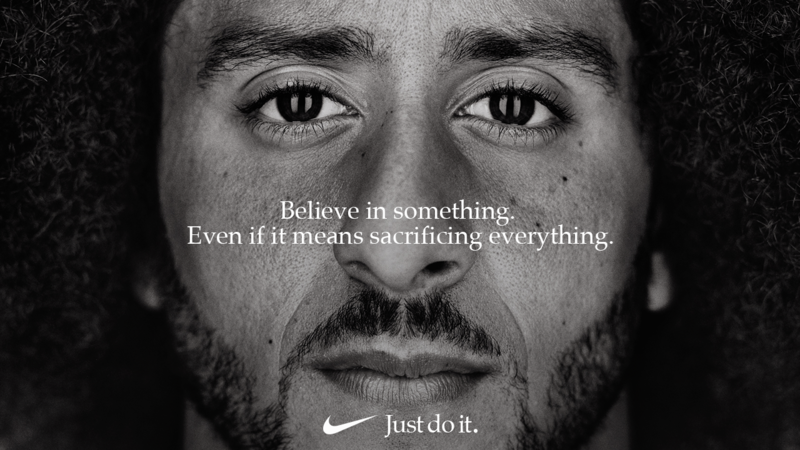 Even if it means sacrificing everything,” was released followed by a commercial TV advertisement narrated by the athlete, who has since become the new face of Nike. Consumer backlash arose immediately after the ad’s release and varying, divisive opinions flooded social media. All the while, Nike was receiving the publicity it sought, and then some, with the creation of the ad. The Colin Kaepernick ad and the controversy that surrounds it is an example of a Fortune 500 company pulling America by its strings. Nike has achieved what every other corporation in America strives for: worldwide recognition. 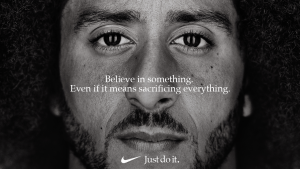 No matter how controversial the ad campaign may be, Nike’s only goal is to appeal to people’s emotions enough to increase brand awareness and sales. Regardless of Nike’s self-proclaimed stance on the issue of racial and social injustices in America, from a marketing viewpoint, its primary goal was to sell. Period. According to Fortune.com, Nike’s stock initially dropped due to backlash over the endorsement deal with Kaepernick, but has risen 5 percent since the release of the campaign. Nike shares closed at record highs throughout last week, which proves there’s no such thing as bad publicity, even if it results in consumers burning merchandise. Regardless of one’s political beliefs, it would be ignorant to deny such inequity exists in America. It would also be impertinent to not recognize how amazing it is that Americans have the right to protest such injustices thanks to many who have fought for us to have this right. Freedom of speech is one of the many great privileges that comes with being a U.S. citizen, and the Nike ad featuring Colin Kaepernick is simply an example of people exercising this right. In this country, whether you choose to stand for the flag that represents the lives of those who sacrifice themselves for our right to speak and protest freely or kneel to bring the injustices that are occurring in the U.S. to the forefront of Americans’ minds, no one should feel afraid to live in a country founded on freedom. Although Nike and a well-paid former athlete profited greatly from an issue that hardly involves either, maybe it was worth it to get the country talking about where we are headed and exactly what needs to change.